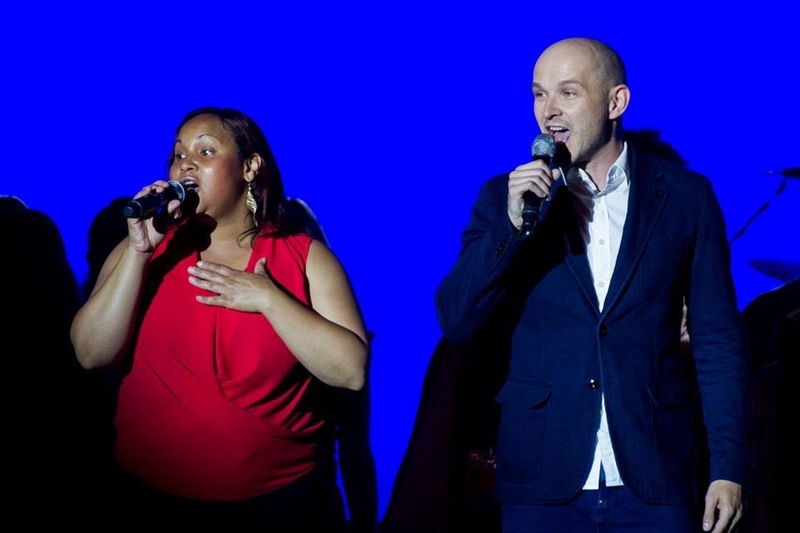 Performing at Up with People’s 50th Anniversary in Orlando, Florida in 2015 together with singer BEKAH. At the age of 19, I traveled with the international education and music program of Up with People, an organization that crosses borders and unites people around the world since 50 years. Up with People is about living in hostfamilies, doing community service, learning about oneself and from each other and last but not last, its about performing arts. Since 1965 Up with People is known for colorful, fun shows performed by its students around the world. Up with People casts performed in Superbowl Halftime Shows, on Red Square in Moscow, at the Olympics in Munich and, even though the organization has no political or religious affiliations, several times for the Vatican with the Pope. I remember my cast performing at Disney’s Magic Kingdom in Florida and for World Youth Days 2000 in Rome when I had the chance to be very close to Pope John Paul II. I am not catholic, but it was quite a moment to “meet” the Pope and to perform live to nearly 2 million people at Tor Vergata. Performing live at Up with People’s Reunion 2010 in Tucson, Arizona together with Christina Halvorson and cast members. So what about performing arts and public relations? Performing arts and public relations are very similar. 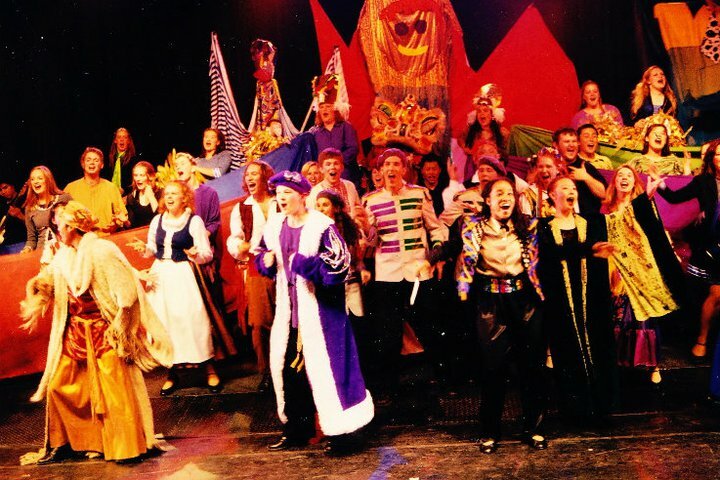 Learning to perform on stage in a 90 min musical show more than 100 times during my year with Up with People definitely helped me making my career in public relations. There are 3 major reasons why performing arts experience helps you in public relations. You know these moments when you have to give a speech at a birthday or wedding or even worst in front of colleagues or business partners? Yeah, feeling “uncomfortable” is not the right word for what you truly go through. What if I fail, how do I look like, what shall I say? Performing arts helps you to understand that no matter how small or big your audience is, you simply do your job and “get the word out”. The more often you perform on stage and present yourself in public, may it be a choir in church or a weekly karaoke gathering with friends, you will surely grow in confidence and increase your selfe-steem. Its not about failing – every talent fails on stage, in the most important moments (I surely did several times) – its about learning and becoming better every time you chose not to be afraid of public. Performing arts is about telling a story. Every song does, every play in a theatre, every musical, every story told on stage. Its all about storytelling and taking your audience on a journey with some drama, some heroes and princesses, some tears, some laughter and surprises. Thats probably the most significant reason why performing arts and public relations are so close to each other, when public relations consultants are asked to craft compelling stories. Compelling! stories. On stage you learn to draw the attention of every single person in the audience to one single point where everything is happening in that very moment. Nothing else is more important in public relations than creating these moments. In PR we do it differently, we can not perform live, we have to use spoken and written words. Regardless, good PR ideas transform this idea of “attention building and focusing” in various ways. Event experts say a good event is only then a good event if people remember it two years later and know who was the host. In public relations (not always about events and live communications, but still), like in performing arts, its about creating memorable moments. People shall remember us and this special moment we shared. There is not always sunshine, neither on stage nor in office. Everyone has bad days. But what you learn on stage is, that “the show must go on”, no matter what. Your passion is to fascinate people, to communicate with them, to invite them on an imaginary journey, to make them smile and happy. In performing arts you learn to perform under bad circumstances, talking not only about your own limitations. Once I had to perform in a warm thick coat on stage, more than 100 hot lamps above my head (no LEDs back then) and air conditioning failed. I fainted in the very last moment of my part when I left stage – my cast mate grabbed me and it nobody even recognized. It was critical, but we got the job done. In performing arts you learn to give your best, your 120%, anytime. A great learning for your job in public relations. If a PR activity is not 100%, skip it. Not every audience is nice to you when you are on stage. You might even get booed. Yes, and maybe the audience is even right. Be better next time. But for this very moment: Continue. Play your role. Get the show done. Safe what you can safe, otherwise simply get through it. Same in business: Not every client and audience likes our PR ideas or the way we perform, no matter how much we try and give our best. Regardless, be professional. Play your role, do your job. Thats another great learning I took from performing in more than 100 shows. Be brave. In one of our Up with People shows lights and sound went off completely. Darkness, no music, no mics. BAM! We were trained to stay on our positions and continue to sing, even without microphones (dancers had to stop of course). No problem. You do your thing. In business its quite similar. Technical failure can ruin your presentation or public speech. But to fascinate people, you need no technical equipment. People told their stories since thousands of years without. You can do too. Just be brave. And last but not least, because you gained confidence through performing arts, you also have the confidence in business situations to react to your audience if they are disrespectful. Once I recognized that everybody was staring on their smartphones not listening to me. I just stopped my presentation and simply asked if we shall continue or if they need a break. Right, you do not need performing arts experience for that, but you need confidence, which I personally gained on stage, in front of 50 people and 2 million.